Here you will find information specific to HYMS which you should be aware of before referring to the other pages on this guide. To arrange department specific training: contact library@hyms.ac.uk. If you are creating a list for a new course from scratch, you can access the reading list system by going here. You will need your York Login. Alternatively, you can send your list to the York Reading List Team using their online submission form and they will create it for you. Note, core course lists will be rolled over automatically and you do not need to 'create' a list each year. 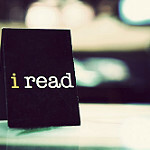 You can access the reading list system by going here. You will need your York Login. 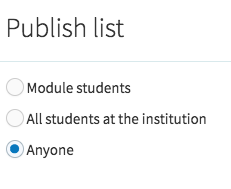 Established lists are available on the course area of Blackboard. If accessing via BlackBoard to edit your list, make sure edit mode is selected. You will then see Edit link for reading list. Login in using your University of York login*. See the York Editing your list page for help and hints. * Note that MB BS Phase II lists can be edited in the year area only: not the specific course area. When adding items to a list always use the Cite it! option. Use this on any website or HYMS Unicat. On Unicat you can select individual items or search strings to add to a list. DO NOT use the inbuilt Reading List search option to add items as this will not always pull relevant search links to HYMS lists. Using the Cite it! tool you can add an item straight to your list or your My Collection area(allowing you to gather together items to reuse on different lists). If a book is not in stock on Unicat: add it to your list from Amazon. If adding an article to your list, add it from the journal platform. The link will be updated by the library to ensure it authenticates via the library providers. If updating an edition, add as a new item and copy relevant guidance and tags from the old reference, then delete the old edition reference. Use the My Bag option to move items around your list more easily. See the Create > Edit your list tab above for more information on this and other features. When you update or add book or book chapters on your list use the tags ito indicate if the item is essential, recommended or background. You can also indicate here if you need the text to be digitised or made available for print impaired students. As well as the tags, use the Library Discussion feature to indicate which libraries need to purchase the title in question. This information is shared with the relevant library partners i.e University of York, University of Hull and/or NHS partner libraries. It is important to always use the 'Anyone' publishing option. 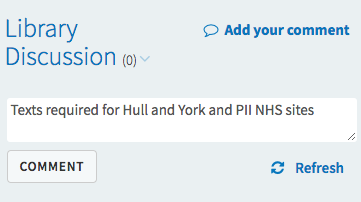 If you select one of the more restricted options this will affect access to some non-York resources. Student link: to create a student link use the link given but with ?auth=SAML removed. Editing link:iIt is also good practice to add a hidden link with the title Edit link for [name of course] reading list. To do this copy the link completely. Ensure that you select for the reading list to appear in a separate window from Blackboard. Note that HYMS reading lists are perpetually live and are not part of the central York rollover. If a course is rolled over the HYMS eLearning Team will include the permalinks to your reading lists.You will then be able to review items for the coming year. 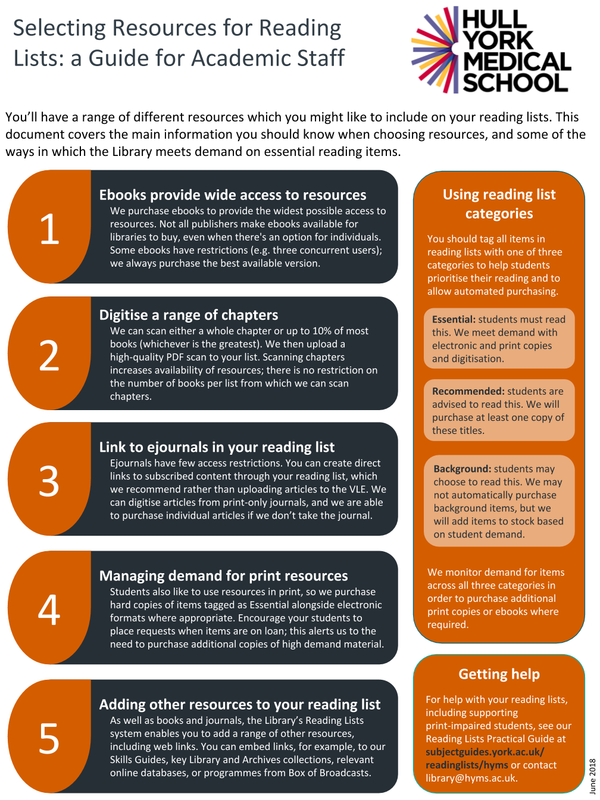 Whilst the York reading list system is the primary reading list system of HYMS, links will be included on the Hull Talis system to the individual lists to ensure that students have orientation to them from all relevant points. What makes a good reading list? Do not repeat a text in different sections unless there is a particular need. Instead, think about themed sections (see above) or an overarching section e.g. 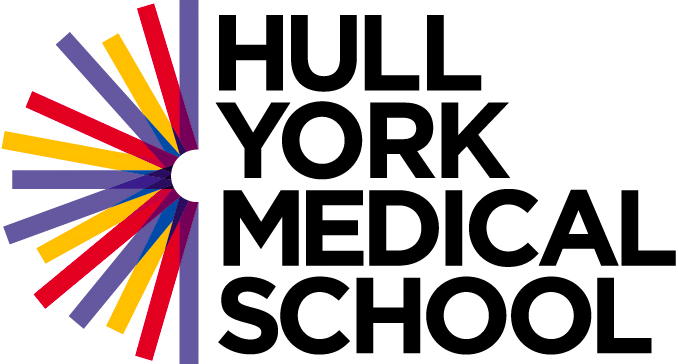 Core books: You will need to consult all of the following throughout this Block..
*All of these example resources and materials are available via http://libguides.hull.ac.uk/medicine/resources and http://libguides.hull.ac.uk/medicine/skills. You can access your course lists from the course areas on Blackboard. A brief tutorial on HYMS reading lists is available here.